I know I know I promised pictures and trust me I wish I had taken some because the bulk of the rods now lie in ruin on my drying screen! I put them in the washer, with a bit of soap, to neutralize them and clean the tree guck off of them and forgot to turn the washer off after it filled. Well lets just say that the agitation cycle is NOT a good for the rods. So I'm thinking that while I can make some constructed cloth with the remaining rods, and there are some that are wonderful, the rest I will make paper *think silk fusion* with this week. 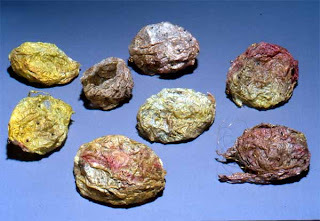 So here's a picture of some silk paper, or silk fusion, seeds that I made circa 1995. 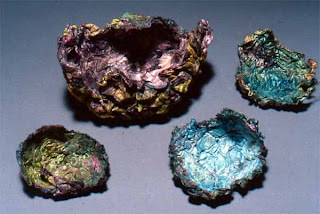 And a few silk fusion bowls I also made. I should really find the box these are in and bring them up to the studio for the Silk Fusion class I'm teaching this fall. In the meantime I will try taking a picture of the rods, damage and all, with my cell phone camera - need to find the digicam again - but can't promise a quality image.